Librarian David Hirsch has helped build the UCLA library's 500,000-plus volumes on the Middle East, North Africa, Anatolia and Central Asia, constituting one of the most significant Middle Eastern research collections in the U.S.
At just 8 years old, Aisha Mokhtar is unlike other kids her age. After finding a special gem in a small, damaged wooden box while working alongside her archaeologist uncle, the young girl finds protection from the gem’s magical powers. Aisha, who is also known as Samda the Invincible, is part of a special team of 99 Muslim superheroes from all over the world who teach wisdom, tolerance and spirituality. These characters have recently made the UCLA Charles E. Young Research Library their home, thanks to UCLA librarian David Hirsch. From his office, Hirsch is on a relentless quest for the old, the rare and the unique. His finds range from comic books — like "The 99" series — to books, magazines, posters, manuscripts and mixed media, to name a few. The languages used in these items are varied, the topics boundless. What binds them figuratively is that they represent the Middle East — its past, present and future. "I really love collection development, said Hirsch, UCLA’s librarian for Middle Eastern, South Asian, Armenian, Jewish and Islamic studies, and the longest-serving librarian of Middle Eastern collections in the entire UC system. "I try to find materials that are not held by every other library, but are of interest to our faculty and graduate students — difficult-to-find materials." In May, for example, Hirsch was in Iraq collecting archival materials from the Yezidis, a Kurdish ethno-religious group with Indo-Iranian roots that currently lives mainly in the Kurdistan region of northern Iraq. Some of these items cannot be found in any other library in the world. Susan Slyomovics, a professor in the anthropology and Near Eastern cultures and languages departments, and former director of UCLA’s Center for Near Eastern Studies for the last five years, first met Hirsch while taking an intensive Arabic program at the University of Cairo in 1980. "You ask him for anything, and he’ll get it," she said of his dedication. "He’ll always find a way." Slyomovics said his collections are unlike anything she has ever seen before, and, as a librarian herself, that’s saying a lot. "I consider him one of the finest Middle East bibliographers." First edition copy from "The 99," a series of comic books depicting Muslim superheroes from all over the world who teach wisdom, tolerance and spirituality. This is, in part, due to his attention to detail and his ability to develop relationships with scholars and booksellers in the Middle East. This gives him access to tips on materials that other librarians might overlook. "One of the strengths of the UCLA collection — besides being up to date and in-depth and across many languages — is that he collects ephemera , meaning things like bulletins, posters, materials on local initiatives and Middle East American organizations. This is the kind of data that becomes crucial for anthropologists and historians. Libraries tend not to do this, but he takes it very seriously. He has made UCLA a real repository for these materials." She says that Middle East scholars from other universities in the L.A. area flock to UCLA to use the resources amassed here. "They consider the library card their most important asset," Slyomovics said. "You can use interlibrary loan, but it always takes time. Or you can come here and work with David who knows the collection and go into the stacks. A lot of scholars join the various groups and centers at UCLA because they can get a library card." His tenacity and love for his work have allowed Hirsch to help build some of the finest collections in the country. The library’s 500,000-plus volumes on the Middle East, North Africa, Anatolia and Central Asia constitute one of the most significant Middle Eastern research collections in the U.S. and the largest on the West Coast. Holdings are particularly strong in Arabic, Persian, Hebrew, Armenian, Ottoman, Modern Turkish, Kurdish, Assyrian and several Central Asian languages. The collection of materials from Yemen and the Persian Gulf countries is considered the most comprehensive in the U.S. The Middle Eastern manuscript holdings are the second largest in North America, with more than 10,000 items in Arabic, Armenian, Hebrew, Assyrian, Ottoman Turkish and Persian. UCLA also houses strong collections that represent populations that comprise the Middle Eastern diaspora, including Iranians in the United States and in Europe, Arabs in different regions and émigré groups. In addition, UCLA has a number of books on contemporary Arab art that are not held elsewhere else, K-12 textbooks from the Saddam Hussein era in Iraq and a variety of Middle Eastern-inspired cookbooks. Why the interest in cookbooks? "If you have an Arab-American cookbook from Wisconsin, for example, it’s interesting to see the types of things people brought with them from their home culture," said Hirsch. "It’s also interesting to see how they adapt local recipes to halal, or other dietary restrictions, how they adapt Middle Eastern recipes to the American palate, and how they made do for traditional Middle Eastern ingredients that they can’t find here." Another key part of his job is to collect materials on works of language, literature, history and the social sciences in English and western languages, in addition to the Middle Eastern vernacular languages — Arabic, Persian, Turkish, Hebrew and Armenian — to name a few. "We also have to manage a balance between print and electronic resources," said Hirsch. "While there are more and more e-resources available in English, the rest of the world is still largely print-based. Even in the English-speaking world there are still many books and journals produced only in print without digital equivalents." Hirsch’s interest in the Middle East began during a trip to Morocco and Spain as an undergraduate biology major at the University of Pennsylvania. "I was first attracted by the Arabic script," said Hirsch. "It is very beautiful and artistic." He later studied Arabic and other subjects at the Hebrew University in Jerusalem for two years, returning to the University of Pennsylvania for a year before receiving a two-year fellowship to study Arabic at the Center for Arabic Studies Abroad at the American University in Cairo. After returning to the University of Pennsylvania, he learned of a University of Chicago program that allowed students to earn a master’s in Middle Eastern studies while simultaneously working toward a second master’s in library science. "Nothing could have been more perfect for me," said Hirsch, who graduated from this program in 1990 after working in libraries at Princeton University, the University of Chicago and the American Institute for Yemeni Studies in Sana’a, Yemen. He joined UCLA in 1989. 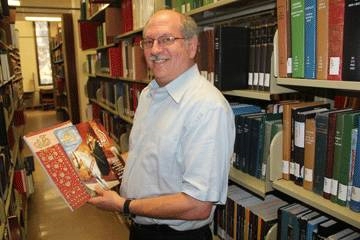 During his 22-year career at UCLA, Hirsch has also had an opportunity "to give back … and gain familiarity with the Gulf" when he took leave from his job in 1998 to spend six months teaching new methods of cataloguing and collection development to librarians at United Arab Emirates University in Al Ain. Hirsch returned there in 2009 after he was selected to serve as chief librarian and, later, libraries adviser at the Abu Dhabi national library, which, at the time, was the only public library serving more than a million residents. "It helped me to extend my network of connections in that part of the world, and expand my knowledge, in terms of children’s literature and the needs of the public who hadn’t grown up with a library." He also helped plan the opening of other branch libraries in Abu Dhabi, which now has six. Hirsch serves as president of the Middle East Librarian’s Association, the main professional association for those working in the field. On campus, he is collaborating with other librarians on a variety of projects, including some exhibits that will be on view this fall. One such exhibit, produced in cooperation with the UCLA Library’s Collecting Los Angeles program, will chronicle Iranian Jews in Los Angeles and run in tandem with the Fowler Museum’s Light and Shadows exhibit opening Oct. 21. In December, the UCLA Library will present Tahrir Documents, a website dedicated to revolutionary materials collected by graduate students during the Tahrir revolution in Egypt in 2011. "The UCLA Digital Library and a number of library staff, including myself, are in the process of making these materials available … and accessible with the latest technologies and standards," Hirsch said. Hirsch is also a much-sought-after speaker, having given presentations and workshops in Oman, Senegal, Mali and, most recently, Iraq about how American libraries develop their Middle Eastern and Islamic collections. When people in the Middle East learn that American libraries collect materials related to the Middle East and Islam, "they were totally flabbergasted," he said. "‘You mean you collect materials? You’re interested in Arabic in the United States?’ I replied, yes, very much so."